Did you think there was a midsummer night’s slowdown? Nope. Lots of stuff going on in my world. You might be interested in these. They’re suitable for family entertainment or music and theater regulars. My grandson and I had a theater bash weekend, his belated 15th birthday treat. We saw Million Dollar Quartet at the Apollo Theatre Friday night and Othello: The Remix at Chicago Shakespeare the next day. Both shows gave us great music as well as compelling theater. We loved both and the next day couldn’t decide which was better. MDQ is in an open run at the Apollo Theatre on Lincoln Avenue. Othello: The Remix by GQ and JQ runs thru July 27 at Chicago Shakespeare on Navy Pier. I saw MDQ when it first opened here in 2009 — and although I say I hate musicals–you gotta love two hours of rockabilly music. It’s a great show–a jukebox musical, certainly–but with elements of character insight and plot points that make it fascinating (especially if you’re a music geek). From the first chords of “Blue Suede Shoes” to the last notes of “Whole Lotta Shakin’ Goin’ On,” the music is infectious and unbeatable. I assume you know the basic story. 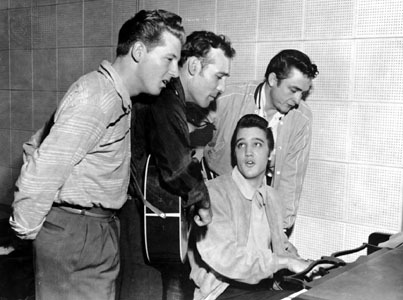 On a certain day in December 1956, four rock stars and almost-rock stars arrived at Sun Studios in Memphis. Each had his own issue to pitch or discuss with studio head Sam Phillips. The music that results is amazing. From Carl Perkins’ hot guitar licks on his Les Paul Gold Top and Jerry Lee Lewis acting up at the keyboard, to Elvis Presley and Johnny Cash singing and playing guitar in their inimitable styles. The great thing about this show is that the four performers are all musicians first as well as credible actors–so it ain’t faux piano playing when Lance Lipinsky hits the keys as Jerry Lee Lewis. Near the end of the show, Sam Phillips wants to take a photo of his four artists. They pose around the piano and recreate the above photo of 57 years ago, which then appears on a giant screen. James and I came home and watched YouTube videos of Jerry Lee Lewis. We wanted burgers before the show, so we went to a great little place just up the street from the Apollo. The Etno Village Grill, at 2580 N Lincoln, serves grass-fed burgers, and homemade soups and salads in addition to European-inspired street food such as Cevap sausages. Everything is made fresh and grilled to order. Sandwiches can be customized with 20 or so condiment options — most of them homemade — such as Etno Spread (feta cheese/sour cream/chilli pepper), great tsatziki, roasted garlic and chive spread (sour cream, roasted garlic, chive) and homemade dill or sweet pickles.. Highly recommended for excellent food quality. It’s a rather rustic, casual environment with counter service. The next afternoon, we watched Shakespeare’s Othello in a hiphop setting. And you know what? It works. MC Othello is a musician who escapes the ghetto and rises to the top of the music industry. He’s in love with and marries a beautiful singer named Desdemona (whose voice we hear but never see). Iago, Cassio and Roderigo play roles something like Shakespeare wrote, transmogrified into the hiphop world. The four talented actors play all the parts, wearing coveralls and grabbing wigs, hats and props when they change characters. And they change characters frequently, with very convincing change of voice and physical demeanor. The musical highlight of the show was surely “It’s a Man’s World” with topical humor merged into Shakespeare’s lyrical verse. The four actors perform it in glamour-gal style wearing gold lame “gowns” and nightclub-singer wigs and jewelry. The plot twists and turns about jealousy and a fabricated affair are played in hiphop couplets with music. The play ends tragically, as the Bard wrote. It’s sharp and inventive and another star performance by the team that created and starred in Bomb-itty of Errors and Funk It Up About Nothin’.